Intel has unveiled the second-generation model of its Classmate PC at its Developer Forum in Shanghai this week. The machine uses the same 900MHz Celeron M processor as the first model, and has been well received with initial reports commenting positively on its chunky aesthetic, seven- and nine-inch screens, 512MB RAM and 30GB hard disk. 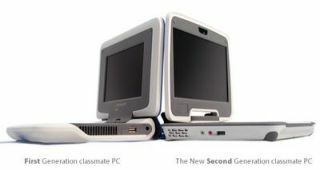 Intel also claims that the second-gen Classroom has an improved battery life with the option of both four- and six-cell batteries, and has named this class of PC as the ‘netbook’. The company is promoting them as ‘blueprints’ for laptop manufacturers. Andrew Chien, vice president of the corporate technology group and director of Intel research, said: "Only five percent of the world's children today have access to a PC or to the internet. Education is one of the best examples of how technology improves our lives." He added: "The Intel-powered Classmate PC is one of the ways we support the IT industry, in spreading the benefits of technology in education for children around the world."